AuditMyPC.com is an extremely simple Internet speed test site that hosts its own Flash-based speed test. This test the offer shows the download speed, upload speed, and latency of your connection to the AuditMyPC.com website. 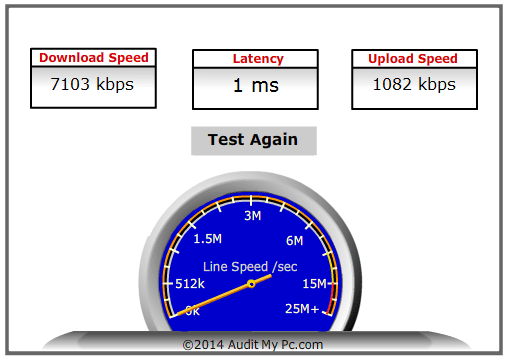 The Internet speed test offered by AuditMyPC.com isn't nearly as comprehensive or useful as similar services. The only real advantage I can give it is that it provides a super quick way to test the speed between your computer and the AuditMyPC.com website. Most bandwidth testing websites give you the option to run tests against multiple servers in several different countries. Those types of tests provide a more accurate representation of your Internet speed because the websites you visit on a daily basis are usually hosted in different areas around the globe. Having just one place to test from with AuditMyPC.com means that the speed listed is only valid for the connection between your computer and this one website. In other words, it won't provide quite an accurate result as similar tools. Other bandwidth testing websites keep an online record of your test results that you can then refer to over time to see if your ISP is manipulating your bandwidth. Or, at the very least, let you download the results to your computer. AuditMyPC.com provides neither of these benefits. It's also too bad that the tool uses Flash to run, because not all browsers have it installed or support it. See my discussion on Flash-based tests versus HTML5 ones for more on this. Overall, I recommend using the Internet speed test at AuditMyPC.com only after you've used the better ones out there, like SpeedOf.Me or TestMy.net.